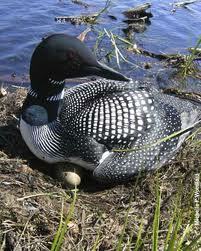 Length : An average grown up Common loon measures between 24 inches and 40 inches. Wingspan : Their average wingspan ranges between 4 ft and 5 ft. Weight : The grown up ones can weigh anywhere between 1.6 kg and 8 kg. Body : This bird has a small head, short neck, and plump body. There are two wings on two sides of the body. They have webbed feet. Their legs are positioned on the back of their bodies, helping them to dive and swim swifter in water. These birds can be a real subject to be observed. They can fly as well as swim in water. They dive into the deepest level of water to catch the fish. They have different types of calls for different gestures. They always fly back to their homeland to breed. They reside near water bodies. They make home in rock walls near those water bodies. Both male and female birds are very co-operative. They incubate the eggs taking turns. They need little run-up to take off. Then they can fly on quite high altitude and at quite a good pace. They can fly at a speed of 70 miles an hour. Common loons have four types of vocalization variations. They call in “hoot” to communicate with each other while approaching towards each other. When they are distressed they call out in “tremolo” signals. They call out loud in “yodel” signals over territorial issues. They call out in “wail” signals to communicate their keenness in interacting with others. This species of the loon family is more of a fish eater than a carnivorous bird. They dive into the water right from the surface and catch their prey. They can even dive 200 ft. deep into the water while fishing. Amongst the fresh water fishes these birds prey on sunfish, perch, bass, trout and pike. They prey on salt water fishes as well. Flounder, herring, sea trout and rock fish are the most common ones that these birds prey on. 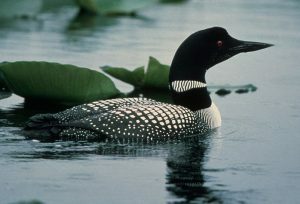 These birds are mostly found in Canada, Greenland, Alaska and northern parts of United States of America. A very small group of them are found in Iceland and an even smaller group has been recorded to inhabit northern parts of Scotland. These birds fly down to the Atlantic and Pacific coastal tip during winters. 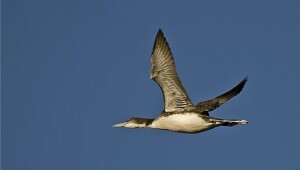 In summers they fly back to their respective homelands for breeding. Common loons tend to nest near fresh water lakes, where there would be forest surrounding the water bodies and the shores would have rocky lines. These birds are monogamous beings. They mostly use the same nest over and over again for breeding. After mating the females lay egg. Incubation period lasts till 30 days almost and both the parent birds equally incubate the eggs. This species of birds have been recorded to live for about 30 years in the wild. When they are bred in captivity their life span depends on how well they are looked after. These birds are born with open eyes and fully covered with feathers on their bodies. Immediately after hatching out the young ones set out for a river ride on their parents’ back. The young ones stay under their parents’ care for about 70-80 days. 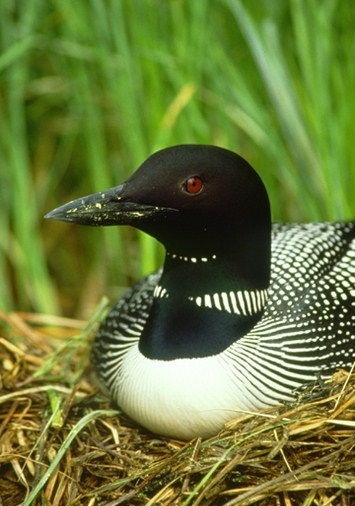 Common loons have predators in all possible places, air, water and land. 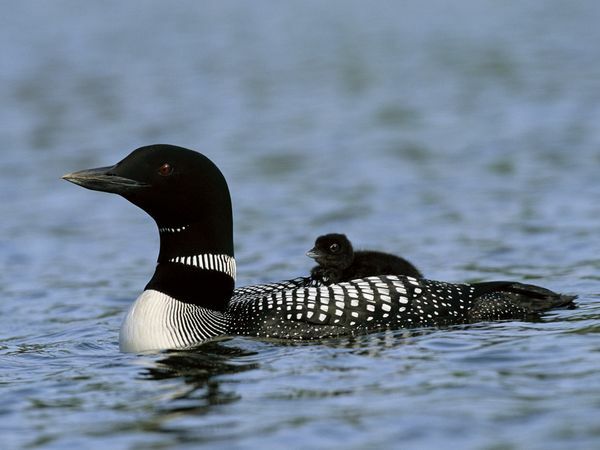 The most common predators of these birds are bald eagles, gulls, ravens, large fishes, weasels, raccoon and skunks. Sometimes they are hunted down by humans also as recreational gaming. Their adaptive features are very less. Thus their survival rate from their predators are also very less. When it comes to coping up with nature then Common loons are great at that. Their diving skills make them great fishers, which is their stable diet. Thus they never starve to death. Their red eyes help them see under water. Their webbed feet are at the back of their bodies unlike other water birds. This helps them in swimming faster under water. Though it takes this bird a little time to take off, but once they fully take off in air it flies quite fast. Know all about petting this beautiful bird. Housing : This bird could be petted only if there is a water body in the backyard. The water body needs to be big enough for the bird to swim around. Their wings must be tied to prevent them from flying away. Food : They diet on fish mainly. Provide them with fish and small insects occasionally. If necessary then provide them some supplements after due recommendation by the veterinary. Caring : These birds are otherwise friendly and easy to take care of. Only thing needs to be kept in mind is that they do not manage to loiter around out of the backyard door. Though they fly but they are not that instinctive and might meet with some accident. According to IUCN reports this species of bird come under Least Concerned category. This means there is no possible threat to the existence of this species. 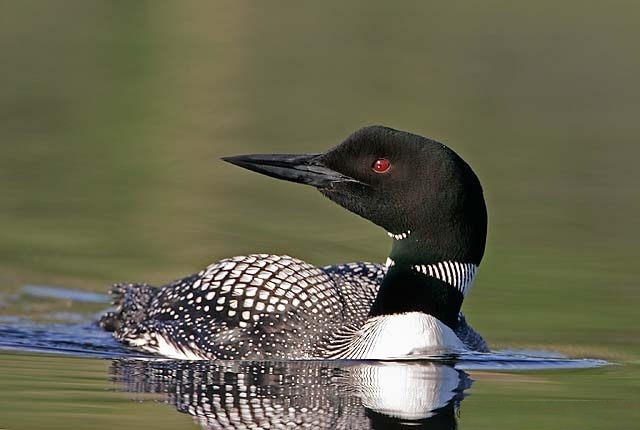 Find out some of the extremely interesting facts about Common loon. The parent birds are very responsible and take turns in incubating the eggs. They can live for as long a period as 30 years in the wild. Though they are migratory birds still they always return home to breed young ones. Check out pictures of this amazingly interesting bird below.